Wow! I've got a big stack o' books here to review. Guess I've been too busy reading to write! The last six weeks or so have definitely been a growing time for me and I've read several books that have inspired me toward better character and better choices. It's been good! After finishing Stepping Heavenward in February, I went hunting for some more encouraging books like it. I've not yet found anything exactly like it---but did manage to snag a big stack of inspirational titles at a local thrift shop. I purchased this at Helping Hands in Bentonville, Arkansas. It's one of those books that you have to be ready to read---otherwise it can get kind of dull and preachy. I didn't realize it---but I was definitely ready to read it. 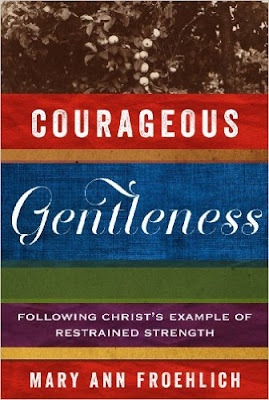 Courageous Gentleness has changed my life. As a kid, I was pretty shy around most people but pretty creative and outgoing around close friends and family. Moving into my adult years, I hit a point at about 30 years old, when I stopped trying to be a people-pleaser, stopped caring so much about what others thought of me, and started discovering who I wanted to be. For the most part, it's been a good experience the last six years. However, there are times when the snarky mean girl comes out and my wittiness is often "shown off" at others' expense. I don't want to be that sarcastic, loud-mouthed witty girl---but I didn't think I could ever be the soft-spoken, listening-more-than-talking sort of person who is content to be still and quiet and keep to herself. I needed balance and this book helped provide that. "Gentleness is a conscious decision to temper one's knowledge, skills, authority, or power with kindness and compassion. Gentleness does not refer to what we do but how we do it. Gentleness does not refer to what we know but how we share that knowledge." Several truths really hit home for me. For instance, the idea of having a humble and gentle spirit often makes girls like me feel weak, wimpy, passive. She says, "Scripture teaches us that those qualities are the most powerful, transformative way to mirror Jesus Christ to a hurting world." That's huge...and more mature than my old way. Ha! I like that she pointed out that we should be developing the fruits of the spirit in increasing quantities throughout our lives because claiming knowledge of Jesus with no fruit makes us ineffective, blind, and unproductive. 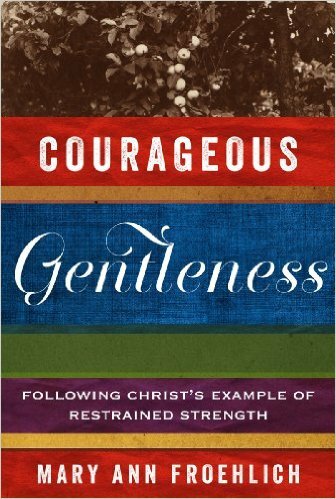 Gentleness is a fruit of the spirit that leads to kindness and self-control. We must make ourselves holy and keep ourselves holy through constant effort and paying attention to how we treat others. This was the second book in a row to quote Thomas a' Kempis multiple times. Coupled with my discovery of an antique copy of The Imitation of Christ at the same time I discovered this book, I think he will be moving to my short list very soon. I'm so glad I came across this little book and will be saving it in my permanent collection to read again later. 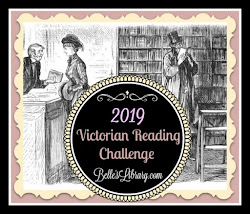 Full House Reading Challenge for "Self Challenge"
You can see all the Reading Challenges I've joined here. I've been too busy reading to write, too!